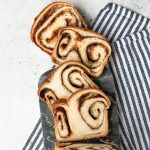 An incredibly tender, soft loaf swirled with sweetness and cinnamon, this Cinnamon Bread is the perfect holiday gift or Christmas morning treat. You know those foods that evoke memories and take you back years? This cinnamon bread is one of those for me. Every year, my mom made loaf after loaf of this bread, and my siblings and I would traipse around the neighborhood delivering it to all of the neighbors. Then we would lug home the cans of pre-made popcorn they had given us in return. Although I like the butter and tolerated the cheese (wouldn’t touch caramel with a ten foot pole), I really think they came out on the good end of that deal. We weren’t allowed to touch the cinnamon bread until Christmas Eve. Then, we would breakfast on toasty slices, butter running between the swirls and dripping onto our fingers. The end pieces were the best—they held the most of the gooey, sweet cinnamon. The shape is actually very simple to make, but yields those perfect, beautiful swirls every time. Just roll that dough out, spread on the fillings, and roll it up. Then tuck one end under to the left, and the other to the right. Make sure they’re secure under the center of the loaf. And that’s really it for a gorgeous loaf that’s sure to impress, every time! Sprinkle the yeast over the milk and butter, give it a quick stir, and allow it to sit for 5-10 minutes, or until the yeast has dissolved and become a little foamy. Combine the flour, sugar, and salt in the bowl of a stand mixer fitted with a dough hook. Pour the milk and yeast into the dry ingredients and mix on low until the ingredients are combined. Turn the mixer up to medium and allow the dough to knead for 4-5 minutes, or until it is smooth and elastic. Shape the dough into a ball. Oil a clean bowl and place the ball of dough into it. Cover it with a clean kitchen towel and allow it to sit for 1-1.5 hours, or until the dough has doubled in size. Once the dough has risen, turn it out onto a floured surface. Preheat your oven to 350°. Use a rolling pin, roll out the dough until it is in a rectangle 12”x18”. Pour the 2 Tbsp. of melted butter over the dough and spread it out with a pastry brush. Sprinkle the brown sugar over the surface and sprinkle generously with cinnamon. Starting along a long edge, roll the dough tightly into a spiral and pinch the edges together. Pinch the ends of the roll also, to help prevent the sugar from leaking out during baking. To shape the loaf: turn one end of the dough under the center to the left, tucking it under the middle of the dough. Turn the other end to right and tuck it under, creating a figure eight with both ends tucked under the middle. Place the dough in a greased 9” loaf pan. Allow it to rise until it has almost reached the top of the loaf pan, then bake fore 30-35 minutes, or until the dough is a deep golden brown and the inside reaches 200° on an instant read thermometer.